A hairy doughnut (2-torus), on the other hand, is quite easily combable. 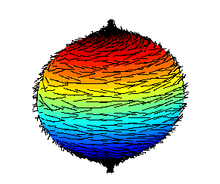 A continuous tangent vector field on a 2-sphere with only one pole, in this case a dipole field with index 2. See also an animated version of this graphic. The hairy ball theorem of algebraic topology (sometimes called the hedgehog theorem in Europe) states that there is no nonvanishing continuous tangent vector field on even-dimensional n-spheres. For the ordinary sphere, or 2‑sphere, if f is a continuous function that assigns a vector in R3 to every point p on a sphere such that f(p) is always tangent to the sphere at p, then there is at least one p such that f(p) = 0. In other words, whenever one attempts to comb a hairy ball flat, there will always be at least one tuft of hair at one point on the ball. The theorem was first stated by Henri Poincaré in the late 19th century. This is famously stated as "you can't comb a hairy ball flat without creating a cowlick", "you can't comb the hair on a coconut", or sometimes "every cow must have at least one cowlick." It can also be written as, "Every smooth vector field on a sphere has a singular point." It was first proven in 1912 by Brouwer. From a more advanced point of view: every zero of a vector field has a (non-zero) "index", and it can be shown that the sum of all of the indices at all of the zeros must be two. (This is because the Euler characteristic of the 2-sphere is two.) Therefore, there must be at least one zero. This is a consequence of the Poincaré–Hopf theorem. In the case of the torus, the Euler characteristic is 0; and it is possible to "comb a hairy doughnut flat". In this regard, it follows that for any compact regular 2-dimensional manifold with non-zero Euler characteristic, any continuous tangent vector field has at least one zero. A curious meteorological application of this theorem involves considering the wind as a vector defined at every point continuously over the surface of a planet with an atmosphere. As an idealisation, take wind to be a two-dimensional vector: suppose that relative to the planetary diameter of the Earth, its vertical (i.e., non-tangential) motion is negligible. One scenario, in which there is absolutely no wind (air movement), corresponds to a field of zero-vectors. This scenario is uninteresting from the point of view of this theorem, and physically unrealistic (there will always be wind). In the case where there is at least some wind, the Hairy Ball Theorem dictates that at all times there must be at least one point on a planet with no wind at all and therefore a tuft. This corresponds to the above statement that there will always be p such that f(p) = 0. In a physical sense, this zero-wind point will be the center of a cyclone or anticyclone. (Like the swirled hairs on the tennis ball, the wind will spiral around this zero-wind point - under our assumptions it cannot flow into or out of the point.) In brief, then, the theorem dictates that, given at least some wind on Earth, there must at all times be a cyclone or anticyclone somewhere. Note that the center with zero wind can be arbitrarily large or small. Mathematical consistency dictates the wind forms a cyclonic wind pattern for at least one point on the planet, but this does not require the cyclone be a violent storm. This is not strictly true as the air above the earth has multiple layers, but for each layer there must be a point with zero horizontal windspeed. A common problem in computer graphics is to generate a non-zero vector in R3 that is orthogonal to a given non-zero one. There is no single continuous function that can do this for all non-zero vector inputs. This is a corollary of the hairy ball theorem. To see this, consider the given vector as the radius of a sphere and note that finding a non-zero vector orthogonal to the given one is equivalent to finding a non-zero vector that is tangent to the surface of that sphere where it touches the radius. However, the hairy ball theorem says there exists no continuous function that can do this for every point on the sphere (i.e. every given vector). There is a closely related argument from algebraic topology, using the Lefschetz fixed-point theorem. Since the Betti numbers of a 2-sphere are 1, 0, 1, 0, 0, ... the Lefschetz number (total trace on homology) of the identity mapping is 2. By integrating a vector field we get (at least a small part of) a one-parameter group of diffeomorphisms on the sphere; and all of the mappings in it are homotopic to the identity. Therefore, they all have Lefschetz number 2, also. Hence they have fixed points (since the Lefschetz number is nonzero). Some more work would be needed to show that this implies there must actually be a zero of the vector field. It does suggest the correct statement of the more general Poincaré-Hopf index theorem. A consequence of the hairy ball theorem is that any continuous function that maps an even-dimensional sphere into itself has either a fixed point or a point that maps onto its own antipodal point. This can be seen by transforming the function into a tangential vector field as follows. Let s be the function mapping the sphere to itself, and let v be the tangential vector function to be constructed. For each point p, construct the stereographic projection of s(p) with p as the point of tangency. Then v(p) is the displacement vector of this projected point relative to p. According to the hairy ball theorem, there is a p such that v(p) = 0, so that s(p) = p.
This argument breaks down only if there exists a point p for which s(p) is the antipodal point of p, since such a point is the only one that cannot be stereographically projected onto the tangent plane of p.
The connection with the Euler characteristic χ suggests the correct generalisation: the 2n-sphere has no non-vanishing vector field for n ≥ 1. The difference between even and odd dimensions is that, because the only nonzero Betti numbers of the m-sphere are b0 and bm, their alternating sum χ is 2 for m even, and 0 for m odd. ^ Renteln, Paul (2013). Manifolds, Tensors, and Forms: An Introduction for Mathematicians and Physicists. Cambridge Univ. Press. p. 253. ISBN 1107659698. ^ Burns, Keith; Gidea, Marian (2005). Differential Geometry and Topology: With a View to Dynamical Systems. CRC Press. p. 77. ISBN 1584882530. ^ Schwartz, Richard Evan (2011). Mostly Surfaces. American Mathematical Society. pp. 113–114. ISBN 0821853686. Richeson, David S. (2008), Euler's Gem: The Polyhedron Formula and the Birth of Topology, Princeton University Press, ISBN 0-691-12677-1 . See Chapter 19, "Combing the Hair on a Coconut", pp. 202–218. Weisstein, Eric W. "Hairy Ball Theorem". MathWorld.